There is an interesting collection of pages from old Kingston Penitentiary inmate description ledgers available on the Library and Archives Canada website. 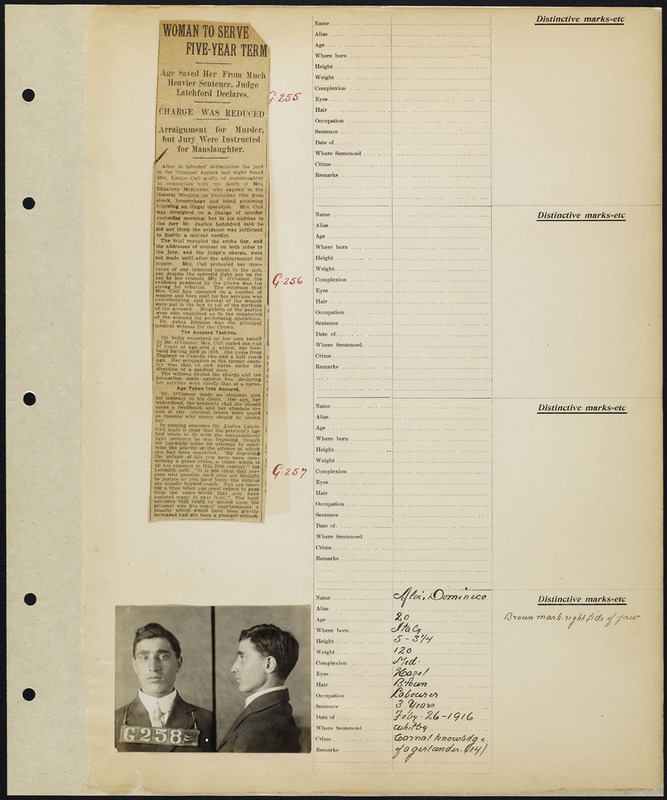 Ranging from the early 1900s to about 1919, these pages provide information such as the convict’s name, age, birthplace, crime committed, distinctive marks, and for men only, two mugshots. I’m not sure why they didn’t photograph women – or if they did, why they kept the photos elsewhere. The circa 1916 newspaper article above is about a woman, Louise Cull, convicted of manslaughter after a woman she performed an abortion on died. Cull “protested her innocence of any criminal intent” but there was much evidence that she regularly performed abortions and was paid for it. A widowed former nurse, originally from England, Cull’s sentence was decreased to five years’ imprisonment due to her age, fifty-seven. March 5, 2016 update: A commenter has clarified that this rally took place instead of a rally in Detroit, which was thwarted by the mayor. This is alluded to in the 1927 Whig article but I wasn’t aware of any direct link when I wrote this post. Anyone who’s dabbled in local history or Ontario history will have likely learned about the Ku Klux Klan’s Canadian operations in the 1920s, and perhaps even seen the photo above. Surprising as it seems, the KKK were here, and in 1927 they spent a day in Kingston burning crosses and inducting Klansmen and women. This story will hit you first with its shock value, but I found that researching the Ku Klux Klan in Ontario was extremely fascinating, and revealed a lot about the province’s past and how much we’ve changed in the ninety years since these events took place. Ad from the 30 July 1927 Kingston Whig-Standard. Pleasant View. April 2014 image from Google Streetview. This house, at 2312 Princess Street, is unmistakable and hard to miss, being as it is surrounded by stores such as Rona and FreshCo in a busy suburban area of Kingston. Set back far from the road, it is a reminder of the surprisingly not-so-distant days when this area was a separate rural town called Cataraqui Village (or sometimes Waterloo Village). Built between 1865 and 1869, the house was constructed by Lewis Johnson Day, who literally built his house with bricks from his own brickyard. After living there for thirty years, Day sold the house in 1899 to a man called Robert A. Marrison, who wrote and privately published the short book The Winter Bird’s Paradise at Pleasant View (1919). He named the house “Pleasant View,” probably because the house sits on a ridge of land (the view from which is somewhat obstructed today), but the name stuck around at least while Pleasant View Greenhouses was at that location. Interestingly, it was Marrison who began the house’s association with gardening, as he opened an orchard and market garden as well as beehives on the property. He was also a great animal lover, as his book attests. Grainy photo of Marrison and what appears to be a chickadee friend from his book. Now I shall tell you what great pets my little feathered friends are. But before I begin I should like to say that I have always given names to all the pets I have ever kept, except snakes and mud-turtles. These never seemed to know when I talked to them. He promised to show great kindness to Pete, and to put him in the store-room, where he kept his flour, and where rats and mice abounded. But I shall never keep a cat again so long as there are birds around my home, that I swear! I don’t really blame him. When my cat, who mysteriously disappeared in 2014, was young, she liked to eat or otherwise destroy goldfinches’ heads and leave the bodies lying around the yard. Also victimized were mice, insects, chipmunks, cute baby bunnies, and once she tried to attack a dog. Cats left to their own devices are vicious marauders. But I digress. Marrison fed nuthatches, woodpeckers, and chickadees, and gave them all names and described their personalities. He had a particular love of chickadees, and enjoyed their simple song (which you can listen to here if you don’t know it, click “Typical Song”), of which he said, “to me its notes are as sweet as any strain sounded by living creatures, or on any musical instrument.” He was devastated when his chickadee Nell, who he supposed was blind, died after flying one too many times into the glass feeder. He found his nuthatches, which he called “Grandma and Grandpa Nuthatch” fascinating as well, and documented how Grandpa mourned his mate when she got sick and died (just three days after Nell). Marrison put her in a box and placed it near the feeder. He then waited until Grandpa returned to find her and hid nearby with a camera, taking two photographs which are included in the book (I’d put one here but the scan quality is really bad). The book ends rather abruptly and was only distributed to family and friends. The archive.org edition, which you can find at the end of this post, has an inscription that reads, “to St. Andrews Sunday School with best wishes from R.A. Marrison.” Robert Marrison died in 1924 in Florida. His son, who was given the unfortunate name Guthbert, was a popular photographer in downtown Kingston. What is the point of reading ephemera like this? Personally, I enjoy it as a slice of historical everyday life and an example of the kind of hobbies practiced by people a century ago – what people did before the internet, you might say. It also “peoples” the house at 2312 Princess, which often just looks kind of empty and alone sitting there amongst the big box stores. I have no idea if it’s currently occupied; last time it was in the news was six years ago when its owner was fighting a heritage designation. It’s a beautiful house, and I like that having read this little book, I can better imagine what winters of 100 years ago were like in this part of Kingston, then just a hamlet on the far outskirts of town. The Winter Bird’s Paradise at Pleasant View (archive.org link). Schliessman, Paul. “Owner to fight city plan to have house designated heritage site.” Kingston Whig Standard, 13 January 2010. Smithson, Gordon D. Cataraqui Village: An Illustrated History of Cataraqui, Ontario. Amherstview, ON: published by the author, 2003. Just a heads up: this story is sad, and while I was researching it I felt depressed and creepy, so you might want to queue up some happy, holiday-themed articles to read after you’re done. (Then again, I live a ten minute drive from where this happened, so the feelings are literally closer to home for me.) Also, I forgot my USB when I was looking at the library microfilm, so I don’t have any actual images from the Daily British Whig newspaper articles that accompanied this story. Sorry about that – a headline or two would have been great. I discovered this story by looking through some Kingston death records from the 1920s – as one does on a Tuesday night – and noticed two girls amongst them who were the same age and both worked at a “confectionery” store. Then I noticed they died on the same day, in the same place (my own community of Glenburnie), and shared the same cause of death: drowning. I was interested, and the next day went to check contemporary newspapers to see if I could find any information about this story. Turns out, it was the biggest story in Kingston during that cool, fateful August of 1923, and although not scandalous or particularly remarkable as tragedies go, its very ordinariness and preventability is what makes it so sad. Occasionally I tend to obsess over the Kingston garrison. This time the object of my fascination is de Watteville’s Regiment, a very interesting bunch of people that refutes the popular image of Upper Canada as being settled exclusively by ex-Americans and (generally speaking) other Anglo-Saxons. But let’s start at the beginning – who was de Watteville and why is his regiment worth talking about? Louis de Watteville, sometimes referred to by his germanicized name Abraham Ludwig Karl von Wattenwyl, was born in Bern, Switzerland in 1776. During the Napoleonic Wars, he first fought with the Swiss army, then with a Swiss corps of the Austrian army which was subsequently taken over by Great Britain upon Austria’s peace with France in 1801. The re-organization of the corps was named de Watteville’s Regiment, actually after Louis’ uncle Frédéric, its colonel – but Louis was made lieutenant-colonel and spent the next dozen years fighting in the Mediterranean. In 1812 he was made colonel of the regiment. Although it [the regiment] was a Swiss unit in the service of Britain, it was largely made up of Germans, Italians, Poles, Hungarians, and Russians, with a handful of Greeks and Frenchmen. Roughly a fifth of its strength, including nearly all the officers, was Swiss. In 1813, the entire party consisted of 41 officers, 1414 men, 8 servants, 45 wives, and 38 children, who after spending two years in Cádiz, Spain, were ordered to proceed to Canada where the Americans were making a nuisance of themselves. (That must have been a rough transition in terms of climate, and basically everything else. Luckily they arrived in Canada in June. Still, from Cádiz to Kingston…) Upon arriving in town on 29 June 1813, de Watteville met and befriended Sir George Prevost, who on top of being commander-in-chief of the British forces in North America and governor general, was also part Swiss! Early that July, de Watteville became commandant of the Kingston garrison, and was promoted to major-general, which meant he had to give up personal command of the regiment. He then spent a pretty boring summer in Kingston, waiting for instructions and falling ill at one point. However, that fall he learned he was posted to command troops in the Montreal district, and he left town, leaving his regiment behind. I’ve tried to find information on them at this point, but there is apparently only one extant edition of the Kingston Gazette available for the years 1813-1814. So, moving ahead – in October 1814 de Watteville (who had been off fighting in the meantime) learned his wife and children had arrived in Quebec from Switzerland to be with him. A few months later, he learned the Treaty of Ghent had been signed, meaning the War of 1812 was over. De Watteville actually stayed in Upper Canada after the war, first commanding troops at Fort George, and then in July 1815 moving back to Kingston with his family (maybe he liked it here?). He was appointed commander-in-chief of the troops in Upper Canada, but decided to retire instead. He left Kingston a year later and returned to Switzerland. They populated the Upper Canada countryside! Well, some of them did anyway – I believe it was common for discharged soldiers at this time, especially those not English-born, to give up and go home due to lack of farming experience and the language barrier. But a few must have remained, and though they were a minority in Upper Canada, they would have provided some interesting multicultural neighbours. This 1814 muster roll shows the great variety in ethnicities in de Watteville’s Regiment: being Italian, I’m particularly interested in the Italian-sounding names: Gartano Lucente, Gioanni Piereni, Carlo Persetti, Placido Dellaqua, Anton Ricci. Many, however, look as if they might have been Frenchified, e.g. Jean Glocowitz or François Wischnofsky. I think it’s important to remember history like this – even though this is a small example – because it shows how easy it is for Canadian history to be whitewashed and declared boring or conventional. But as I have explored before (here and here and here), Canada was home to diverse sets of people even in its early days, and it’s a lot of fun to discover them in your own neighbourhood. I mostly used the Dictionary of Canadian Biography page on Louis de Watteville for this post. There are also some interesting Wikipedia pages on de Watteville and the regiment. I’ve been kind of beating you over the head with churches lately – my last historic site post was also about churches – but as you can see Old Hay Bay Church is something rather different. It was built on the south shore of Hay Bay, between Napanee and Adolphustown, in 1792 and stands as the oldest surviving Methodist meeting-house in Canada. To me, it looks like a piece of New England plunked into the Ontario countryside. P.S. this is the first of my historic site visit posts. This one was done really on the fly, but I promise future ones will have more information and be generally better planned out. Stay tuned! Last week while going to Gananoque to visit the kitties at the Humane Society, I had the opportunity to stop at Willowbank Cemetery. My reasons for doing this were twofold: one, I love exploring old cemeteries so much that if left to my own devices I’d probably stay in there for three and a half hours and forget to eat lunch; and two, one of my very favourite local history people, Joel Stone, is buried there. 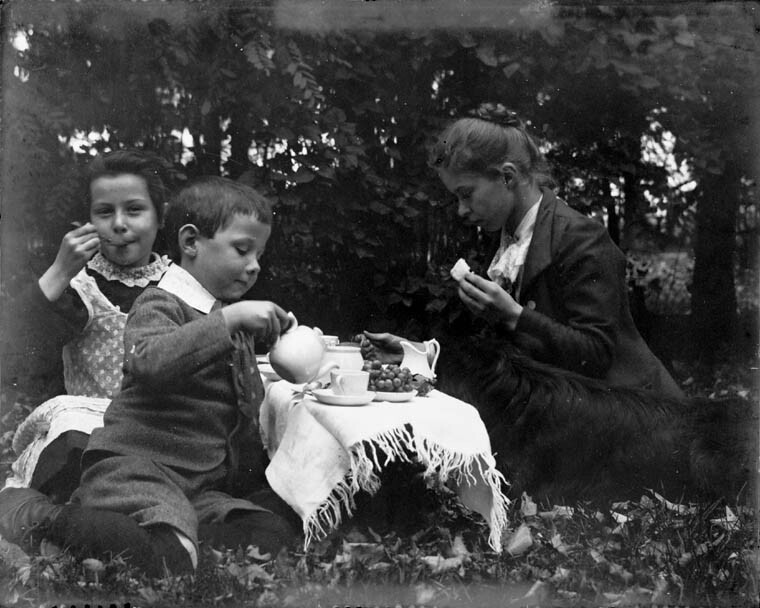 Before you ask, no those kids in the picture aren’t from Kingston or the child referred to in this post, they’re children who lived in Ottawa in the 1890s. But it’s a cute photo and has the right vibe for the text of this post, which is why I included it. The title of this post is the original title of a piece composed by Daisy Chown for the 1973 book I Remember When: Stories of Kingston Folk. I believe members of Rideaucrest Home contributed stories for it, and a lot of them are really interesting, especially if, like me, you enjoy reading about the minutiae of daily life 100+ years ago. The Chown family was basically Kingston royalty, and there are still places around the city named for them (e.g. Chown Hall residence at Queen’s). Daisy Chown was born in 1881, and so was around ninety-two when she recounted her early life on what was originally called Gordon Street, now University Avenue. I’m copying it here word-for-word, except for a few typos which I’ve corrected. It’s a bit of a disjointed narrative, but I think that adds to the charm. “I remember when we moved from Bagot Street to University Avenue, then called Gordon Street, in November 1887. The sidewalk was two planks wide, laid lengthwise. Later sidewalks were planks, maybe 5 feet wide, laid horizontally. Finally, there were cement walks. “When I was teaching in Whitby Ontario Ladies College in the 20’s, one of my duties was to take as many as 100 girls walking – we called it a division. The sidewalks were of boards, and often a board came off where one could tumble and break an ankle. The front girls in the line said ‘board off’ to the ones behind them, and the word was passed back until it reached me at the end of the line. “I started school at Gordon Street School which was on the corner where Ban Righ Hall now stands. It was a four room school which would be called a fire trap now, the staircase to the upper two rooms being in a shed-like addition at the back. The only entrance to the upstair front room was through the back room. It’s very likely that if you don’t live in Prince Edward County (and/or are not obsessed with local history) you haven’t heard of Demorestville. It’s a little town – almost a ghost town – in the northwestern part of the County that hasn’t seen much excitement in, oh, a hundred and fifty years or so. But once upon a time, things were different. Demorestville was at one point one of the biggest towns in Upper Canada, rivalling Picton, Belleville, Toronto, and Kingston for size and primacy. Then, around the middle of the nineteenth century, it began to slowly but surely decline. Why did this happen? Forgotten as it is today, Demorestville has one of the more interesting histories of Ontario’s tiny towns. Let’s dive into it. Once you see it, you can’t unsee it. At least I can’t. This is the original KCVI building, constructed in 1892 and destroyed some time prior to the 1970s (if anyone can tell me a more exact date that would be great). It has a typical turn-of-the-century school look with a big gabled roof similar to the one originally at Macdonald School.